January 2017 is in the books and what a month it was! We saw a little bit of everything from snow to strong and damaging Chinook winds. Just another roller coaster month in Castle Rock’s weather history. Mean temperatures were largely below average for the month. The month overall had big swings in tempreature but you’ll notice the large dips to the below average in the first part of the month and later throughout the month. The finishing average temperature for January finished quite a bit cooler than average, mainly thanks to the strong arctic cold fronts that made their way into the area. Snowfall was less impressive, but was just enough to be close to average. 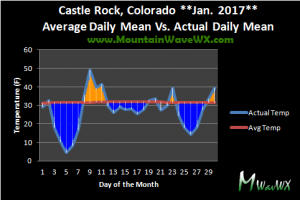 January is not historically a particularly snowy month for Castle Rock and many of the Palmer Divide cities. Snowfall accumulation and cover statistics, provided from our new weather dashboard. (See link below!) Generally only two decent sized snowstorms and neither one was impressive for Castle Rock in January. We are introducing our new real-time weather dashboard today. You can view current weather conditions for Castle Rock, see past trends and statistics and even pull up snowfall and climatological reports. The best part is all this data is from our professional grade weather station right here in Castle Rock, Colorado! 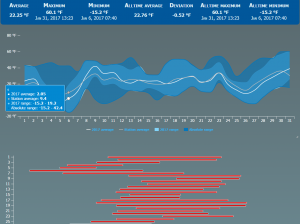 Apparent Temperature (feels like temp) statistics, provided from our new weather dashboard. (See link below!) Our coldest apparent temperature was a balmy -15.2 on January 6! See January 2017’s Report from our Dashboard! — Also has all of 2016’s weather data built in! 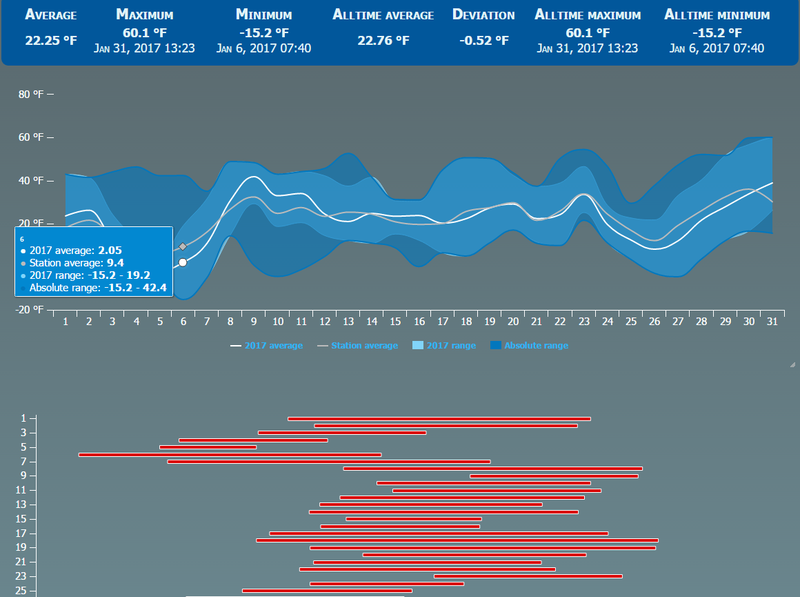 View our entire January 2017 Stats and Write-Up Here — Also has a sneak peak of February 2017’s expected weather.